Tax fraud is already prevalent, and fraudsters are more sophisticated and automated than ever. Tax agencies can get ahead of the game by detecting fraud and protecting revenue with the help of advanced and predictive analytics. Legacy processes, systems and attitudes need not stand in the way. What are the top three things tax agencies should know and do about analytics for tax fraud prevention? And what can tax agencies do differently (and better) today than just a few years ago? 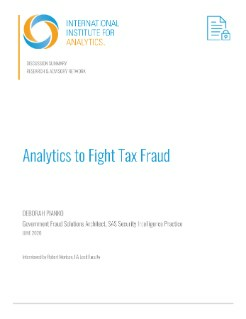 This discussion summary from the International Institute for Analytics featuring SAS explores the challenges, opportunities and value of tax fraud analytics.